Viveltre’s gourmet flavored coffee brings the classic childhood favorite to life in our Chocolate Peanut Butter & Jelly blend. We start by infusing our light Arabica roast with a velvety combination of chocolate and peanut butter. We then add a delightful raspberry flavor which adds a sweet and fruity kick. The result is an absolutely delicious cup of coffee that whirls you into happiness. 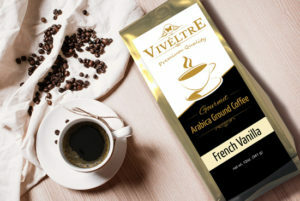 Viveltre’s gourmet flavored coffees are brewed locally in small batches. Viveltre uses 100% Arabica beans and the highest quality goes in to each batch. We proudly uses green coffee roasters to reduce our carbon foot print.